Portsmouth NH Homes Sales for the first half of the year. Can you believe 2016 is just a few days away from being half over? The halfway mark is a good point to look at where we’ve been in order to make a prediction about where Portsmouth home sales will likely be headed for the remainder of the year. 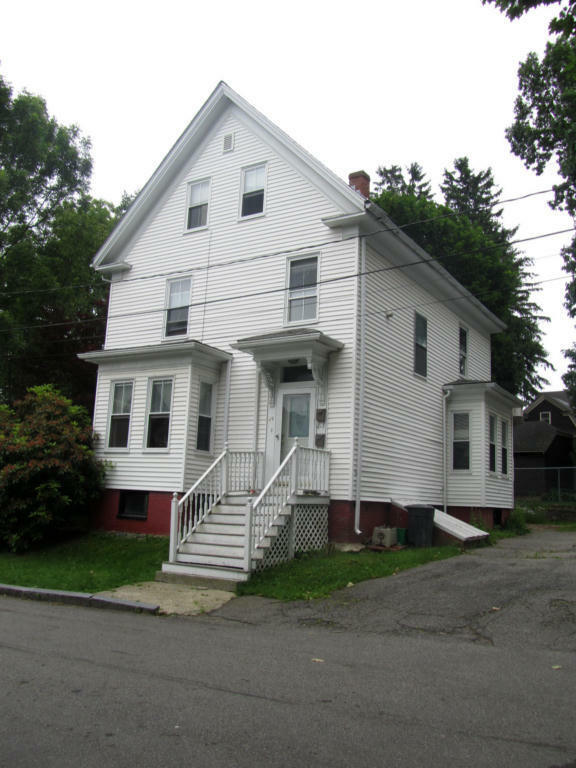 So far this year the Northern New England Real Estate Network (NEREN) tells us Portsmouth has had 66 sales of single family homes and 53 condo sales. The most active Portsmouth price ranges break down as follows: 9 sales in the $200,000 to $249,900 range, 8 sales from $250,000-299,900, 17 from $300,000-$399,900, and 13 sales from $400,000 to $499,900. There have been two single family sales that closed at over one million dollars. Of the 53 condo sales the hot price ranges were: 5 sales in the $120,0000-$139,999 range, 16 from $300,000-$399,999, 6 from $400,000 to $499,999, and 4 from $500,000 to $549,999. Two condos closed for over one million dollars. The Portsmouth NH real estate market remains very active with more buyers than sellers which tends to drive up prices. Currently the absorption rate for Portsmouth homes and condos is 2.8 which means it would only take 2.8 months to sell all the homes currently for sale if no new listings came on the market. That means if you’re thinking of selling your Portsmouth home NOW is the best time; lots of buyers looking and not many selections. For buyers it means you may not have as much negotiating leverage as you could have in a slower market. We’re seeing multiple offers on homes and sales for over list price is not uncommon. One interesting fact is how are most buyers paying for the homes they’re buying. 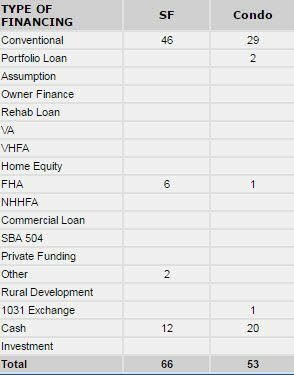 Here’s the breakdown: 75 sales had conventional financing, 7 FHA, 32 were for cash, 1 was a 1031 exchange (we’ve done a couple of those this year), 2 were ‘other’, and 2 were portfolio loans. Typically a portfolio loan is one a local bank does that they don’t intend to sell on the secondary loan market like Fannie Mae or Freddie Mac. If you’re think of selling your Portsmouth home or condo we can give you a quick estimate of its value right here. 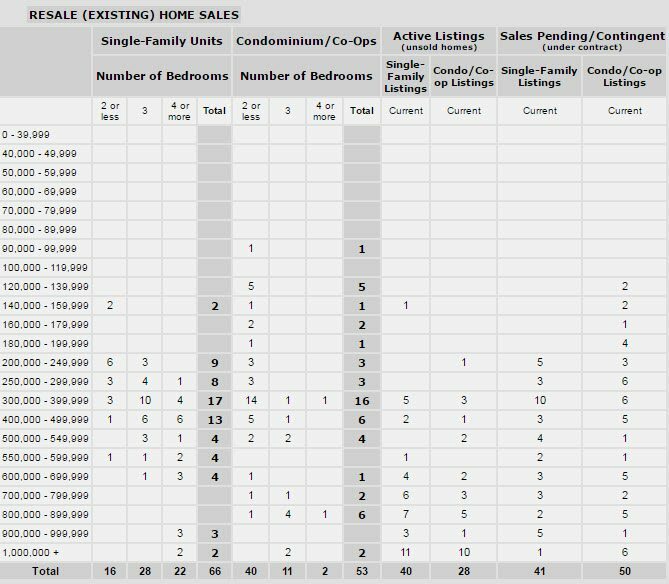 However automated valuation models like this are only based on an algorithm from raw sales data and can’t take into account many other factors such as your home’s location, condition, improvements you may have made, and other factors. If you would like a better estimate of what your home would likely sell for we’re happy to provide that service for you free of change and no obligation. 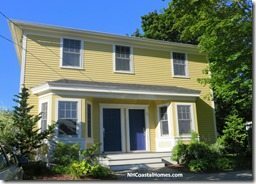 Visit our website, NewHampshireMaineRealEstate.com to see all the New Hampshire Seacoast and southern Maine homes for sales as well as some great seller and buyer tips. If you would like to find out more about Ann Cummings and Jim Lee we also have some references and great testimonials for buyers and sellers we have worked with. Hi , Your article is very well written and well purposed. It will also help new bloggers to time ahead and plan their strategy for creating blog posts. Thanks!